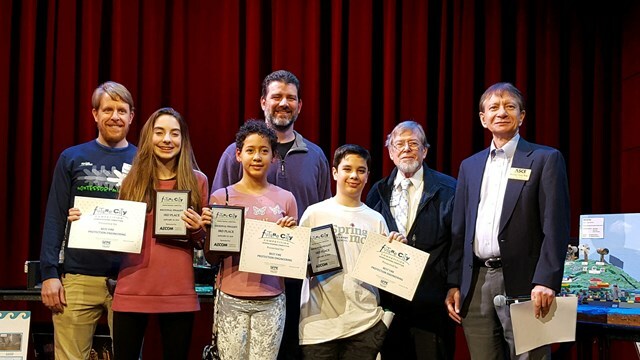 Middle School Students Place 3rd in Statewide Future City Competition! Congratulations to Lydia, Thomas and Zoe whose "Terminus" placed third out of 34 entries in Saturday's "Powering Our Future"-themed Future City Competition! Springmont was well represented, sending 5 teams to this statewide middle school STEM event focused on engineering. This year's challenge was to design an electrical grid that could withstand and quickly recover from the impact of a natural disaster. Teams were judged by a panel of STEM professionals based on their project plans, scale models built from recycled materials, 1500-word essays, virtual cities and event-day presentations. In addition to 3rd place overall, "Terminus" also received a special award for best fire protection engineering; and "Luzzato," created and presented by Riley, Sanaa and Thierry, received a special award for best use of water resources. Thank you to Springmont parent Greg Lamps who served as the teams' mentor and to Thomson Chuites, Springmont's Middle School Science Teacher, for coaching and guiding the students throughout their semester-long preparations. Future City is part of Springmont's Middle School curriculum every other year. "Terminus" will be on display in the Media Center for the next several weeks. Make sure to stop by to see all the additions and enhancements added since Academic Fair. Look for more pictures on Facebook later today!